Notice! It was reported in this forum thread that the Coke Ovens are on private property that is closed to the public. Note: Railroads are typically private property. Following them is typically illegal. If posted "no trespassing" definitely do not press your luck. 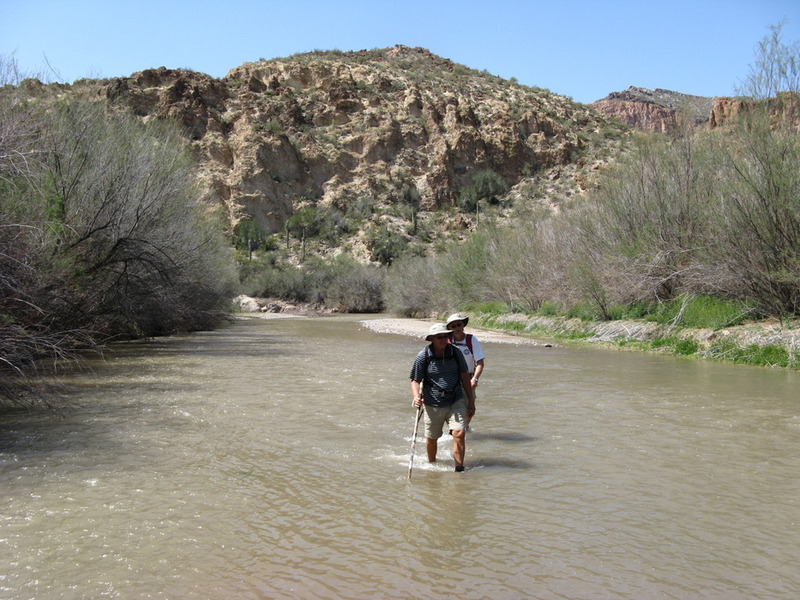 The Gila River is a public waterway and legal to follow except in rare posted areas. Overview: For some time we had wanted to hike to the Coke Ovens, but following the jeep trails is a long way whichever way you go. This description describes our first 12.5 mile hike starting from the railway trestle at the end of Price Rd. The way points in the associated gps track are recommended aiming points. The track itself is our actual track and we would definitely do some parts differently next time. The obvious route is to hike the railway tracks, however that places you on the south bank of the river. While we returned by fording the river, our goal was to find a route on the north bank so that a river crossing was not necessary. Warning: This is a Wilderness hike. Once off the jeep tracks, there are no trails and no cairns. Do not try this if you are not comfortable with route finding, map and compass or GPS navigation. Our route included a river crossing, and while we believe that we could have returned without fording the river, we did not do that. Watch this space (or add to it). 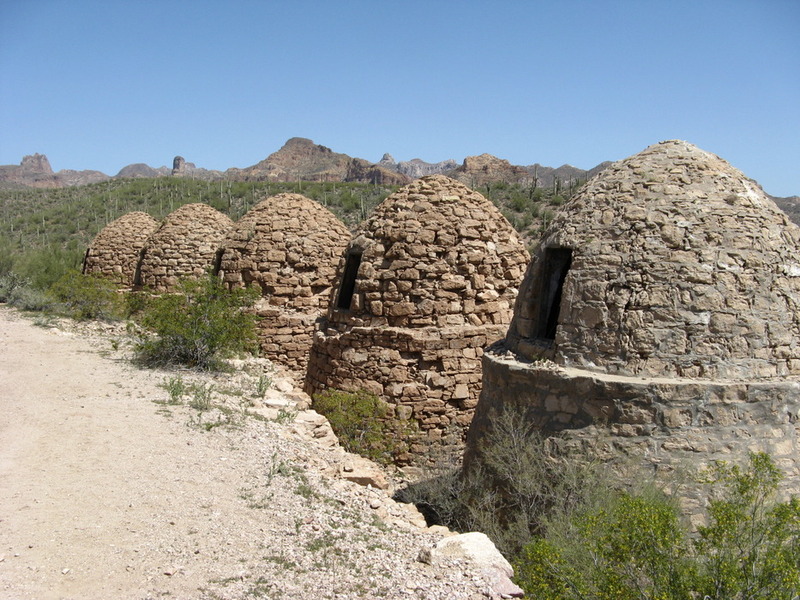 History: The Coke Ovens were built and operated at the end of the 19th century and provided charcoal for smelters in Cochran. Hike: From the wash, follow the railway tracks, or the dirt track on the south side of the tracks, about 3.5 miles to the railway tunnel entrance. 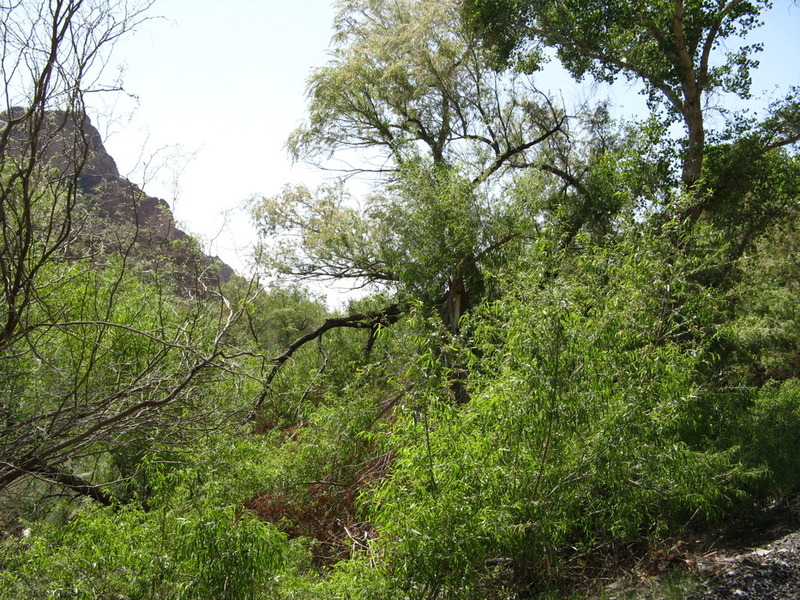 This is a pleasant stroll between the cliffs and the luxuriant vegetation bordering the Gila River. We had planned on ascending the drainage on the left, heading for the low saddle below North Butte. That drainage was very overgrown. We took an animal track on the right immediately before the tunnel mouth and crossed over the railway heading for the low saddle to the north. The way up was steep with plenty of loose stones, however with a bit of zigzagging the ridge above the tunnel was easily reached. Everyone knows that the Coke Ovens are visible from great distance, so we headed for the cliff edge for a look. Nothing to be seen! We continued north towards the saddle, passing to the West of the knob. That was easier said than done as the knob had some very steep rocks. Had we known that the Ovens were not going to be in sight, we would have kept lower, passed the knob on the 1760 ft contour and ascended to the saddle (1860 ft) over a much less steep route. From the saddle, our plan was to descend the drainage towards the Gila River, pick up a jeep trail and follow it to the Coke Ovens. The drainage towards the river was very overgrown and had almost shear sides. We headed East down the slope until we came to more level land, then turned North until we came to lower cliffs and reached the creek bed. From here head slightly north of east about 0.1 miles arriving at the top of a dry waterfall (and avoiding the steep sides of this drainage). From here, ascend the other side of the creek heading directly for the coke ovens. This ascent was also over steep, loose stones, but with zigzagging the ridge was again easily reached. Continue due East, descending again to the top of yet another waterfall at the head of a small shear sided canyon. Continue more or less North East and cross this plateau. A jeep track is visible from the top, giving a good aiming point. Join this track in the wash (or visit the top of the final waterfall very slightly south). Follow the track south east to the top of the hill. At this point, we turned due east, crossed the plateau and rejoined the jeep track after about 0.25 miles. It is possible to continue on the jeep track and come to the same point after about 0.4 miles. We did not know this at the time! Turn left on the jeep track, go up the hill and the Coke Ovens appear. The total distance since leaving the railway is about 2 miles and took us about 2 hrs! We returned along jeep trails, river crossing and railway. 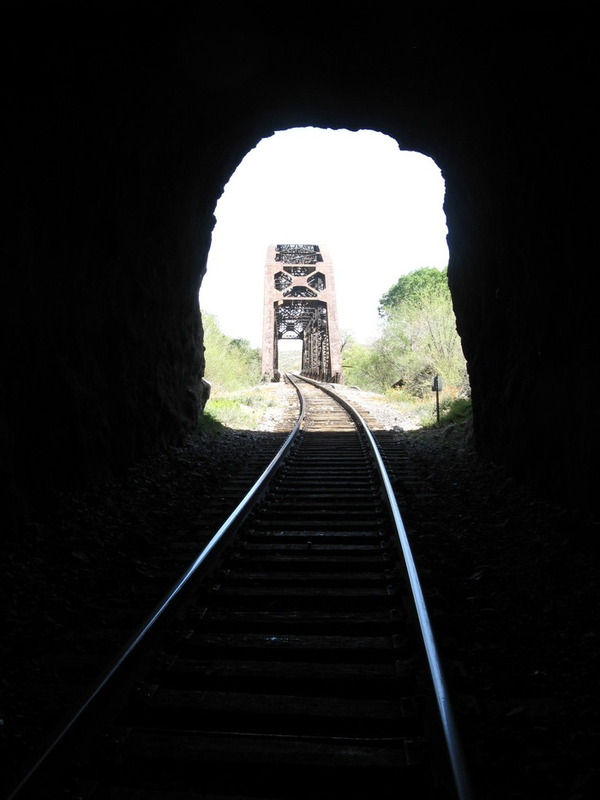 From the Coke Ovens, we retraced our steps along the Jeep trail, keeping left on the trail. After about 0.1 miles, the jeep trail is heading due East. We saw an old pipeline heading south and followed it. The pipeline reaches a track close to derelict structures (windmill, tanks). Turn right and follow the track for 1.25 miles, where it reaches the cliffs on the north side of the Gila River. The track turns left into a wide area. A very short track turns right into the river. Follow that track and turn east along the river following the sand bar. The track can be seen continuing on the far side of the river. We forded the river at a flow of about 126 cu ft/sec (Kelvin gauge) and the water was no deeper than knee high and mostly mid-calf height. The bottom is large pebble and felt secure at all times. We found no slippery rocks, sudden drops or any other under water hazard. The river flow is strong enough to need to keep facing the current while crossing. Follow the track and, when the bank gets lower, push through the mesquite and reach the railway tracks about 400ft south. Alternatively, follow the track about 0.2 miles from the ford, turn right and reach the railway. 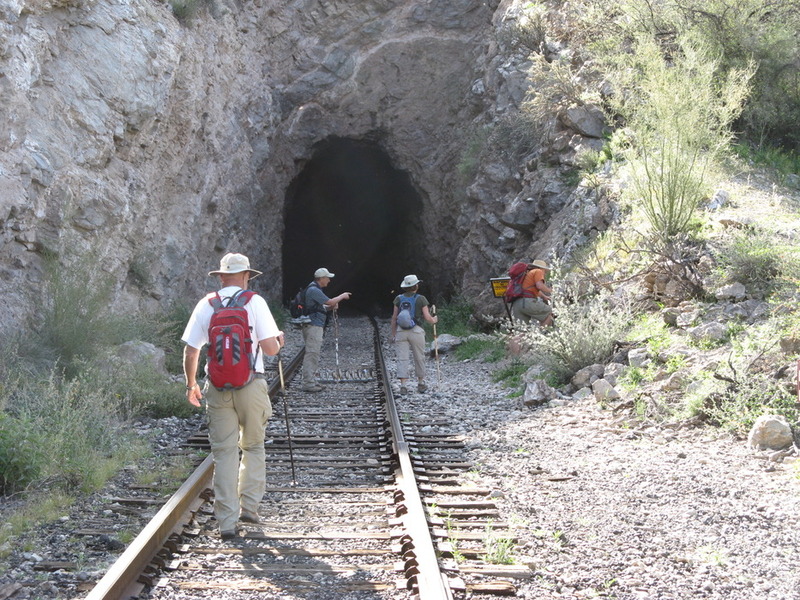 Follow the railway west across the Gila River bridge, through the tunnel (headlamps useful) and hike back to Price and the car (about 4 miles). From Phoenix, take US 60 East to AZ Hwy 79. Follow Hwy 79 about 14 miles south. Turn Left onto Price Rd after crossing the railroad tracks. Follow Price Rd (tarmac becomes dirt) for about 10 miles. When Price Rd turns sharp left, turn right and park in the wash alongside the railway. From Tucson, take AZ Hwy 79 through Florence. About 2.5 miles north of Florence, just before the railroad tracks, turn right into Price Rd.